(Okayama, 09 January) Research led by Okayama University Graduate School of Medicine identifies a protein that ameliorates liver damage caused by diet induced obesity. “Non-alcoholic fatty liver disease (NAFLD) is now considered the most common cause of chronic liver disease worldwide and the prevalence has increased beyond 30% in developing countries,” say Jun Wada and colleagues in a recent report. Their research shows that overexpression of the protein Gpnmb can help work against the oxidative stress and fibrosis of the liver that results from diet-induced obesity. 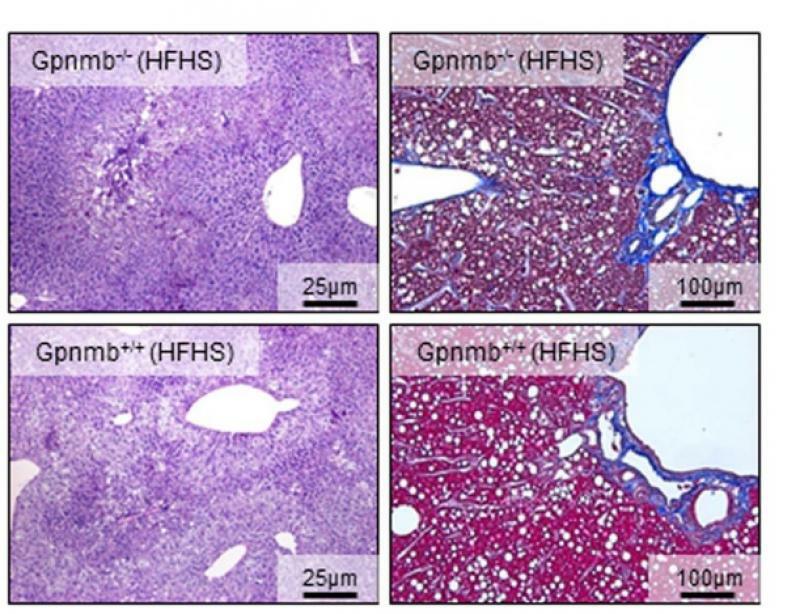 Although Gpnmb was mainly detected in the adipose tissue, the researchers observed its presence in certain liver cells in the transgenic mice, although not wild-type mice. They found that serum too contained Gpnmb and that a high-glucose high-sucrose diet increased sera Gpnmb levels in both the transgenic and wild-type mice. The researchers next tested Gpnmb levels in human patient sera and found it increased for type 2 diabetes patients compared with patients with a normal glucose tolerance, and increased further still for patients with non-alcoholic fatty liver disease. They suggest that Gpnmb is a promising diagnostic marker and that it may be a key therapeutic molecule for non-alcoholic fatty liver disease. Fat deposited in the liver (steatosis) for reasons other than excessive alcohol consumption is termed non-alcoholic fatty liver disease. Progression of the disease is linked to insulin resistance and a cluster of medical conditions called the metabolic syndrome, which includes abdominal obesity and high blood pressure, and is associated with the development of high blood glucose concentration. High accumulation of fat in the adipose tissue leads to the release of high levels of fatty acids and other proteins. The liver is then exposed to fatty acids circulating in the blood. Non-alcoholic fatty liver disease can respond to similar treatments to those for insulin resistance and metabolic syndrome, such as weight reduction and type 2 diabetes drugs. Severe non-alcoholic fatty liver disease can develop into non-alcoholic steatohepatitis, and cause cirrhosis where the liver no longer functions properly. This can ultimately lead to abdominal fluid build up, which may lead to infections, swelling in the lower legs, tiredness, itchiness and weakness. Previous research originally identified Gpnmb in an animal model for osteopetrosis. It has been observed in melanoma and breast cancer, as well as other cell lines, although its prognostic potential for breast cancer is deemed poor. Previous work had also identified increases in Gpnmb in a fatty breed of mouse when treated with a diabetes drug or insulin, and a decrease when exposed to free exercise. The current study focused on characteristics of transgenic mice with increased Gpnmb because the phenotype that did not express Gpnmb was limited. The study revealed reduction in liver damage in the transgenic mice with elevated levels of Gpnmb, as well as lower cholesterol and signs that oxidative stress was being ameliorated. They also identify proteins, including calnexin, collocated with Gpnmb that may indicate the mechanism behind its activity. The increased Gpnmb levels observed in the sera of human patients with non-alcoholic fatty liver disease was significantly greater for those with non-alcoholic steatohepatitis, as opposed to the less extreme steatosis. In this respect the researchers suggest it may prove a useful marker for diagnosis. The researchers also highlight the need for caution in exploiting the potential therapeutic effects of Gpnmb for non-alcoholic fatty liver disease, since high levels of it are also observed in breast cancer, melanoma and pancreatic cancer. While there have been reports suggesting that Gpnmb suppresses tumours more research is needed to clarify its role. Akihiro Katayama, Atsuko Nakatsuka, Jun Eguchi, Kazutoshi Murakami, Sanae Teshigawara, Motoko Kanzaki, Tomokazu Nunoue, Kazuyuki Hida, Nozomu Wada, Tetsuya Yasunaka, Fusao Ikeda, Akinobu Takaki, Kazuhide Yamamoto, Hiroshi Kiyonari, Hirofumi Makino & Jun Wada. Beneficial impact of Gpnmb and its significance as a biomarker in nonalcoholic steatohepatitis. Scientific Reports 5 16920, 2015. Professor Jun Wada, M.D., Ph.D. Periodic acid-Schiff (PAS) staining (left panels) and Azan-Mallory staining (right panels) of liver tissues of Gpnmb-/- (no expression) and Gpnmb+/+ (enhanced expression) mice fed high-fat high-sucrose chow.